Recombinant fusion protein containing a sequence corresponding to amino acids 777-976 of human PARG (NP_003622.2). Small volumes of anti-PARG antibody vial(s) may occasionally become entrapped in the seal of the product vial during shipment and storage. If necessary, briefly centrifuge the vial on a tabletop centrifuge to dislodge any liquid in the container`s cap. Certain products may require to ship with dry ice and additional dry ice fee may apply. Poly(ADP-ribose) glycohydrolase (PARG) is the major enzyme responsible for the catabolism of poly(ADP-ribose), a reversible covalent-modifier of chromosomal proteins. The protein is found in many tissues and may be subject to proteolysis generating smaller, active products. Several transcript variants encoding different isoforms have been found for this gene. 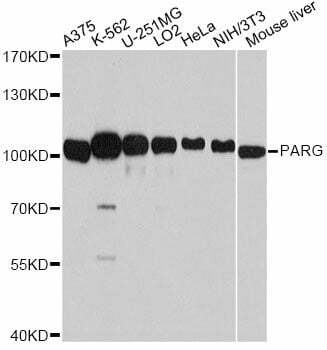 Western blot analysis of extracts of various cell lines, using PARG antibody at 1:7000 dilution. 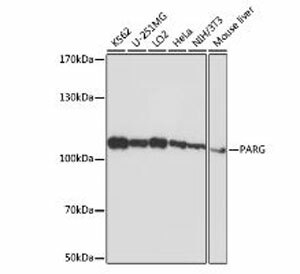 Western Blot analysis of extract various cells, using PARG antibody (MBS9131066) at 1:1000 dilution ratio through one-step method. IgG (H+L) (MBS128200) at 1:4000 dilution. Lysates/ proteins : 25 ug per lane. Detection: ECL Basic Kit (RM00020). NCBI/Uniprot data below describe general gene information for PARG. It may not necessarily be applicable to this product. PARG: Poly(ADP-ribose) synthesized after DNA damage is only present transiently and is rapidly degraded by poly(ADP-ribose) glycohydrolase. Poly(ADP-ribose) metabolism may be required for maintenance of the normal function of neuronal cells. Belongs to the poly(ADP-ribose) glycohydrolase family. 3 isoforms of the human protein are produced by alternative splicing. 1. Data show that poly-(ADP-ribose) polymerase 1 (PARP1) opposes the function of poly-(ADP-ribose) glycohydrolase (PARG) during regulation of bone morphogenetic protein target gene expression.